"Lately DHTRob came to me with a pair of brandnew powertriodes, type AV305M, with the intension to give these a try as Rob thought that these tubes could be "it" for me........ As service in return I had to write down my findings. I am playing with the VAICVV300B, "Emission Labs" now-a-days, for quite a long time now and these tubes have a good reputation. After having the tubes unpacked from their bomb-proof packing, I compared them to the VAIC 300B's. 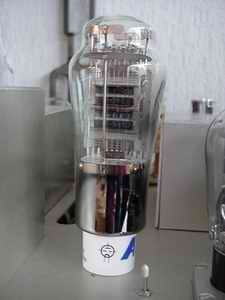 Referring to model and dimensions these could be brothers; solid glassbulb and good weight. These are tubes written in capitols. For each tube a ceriticate of guarantee, signed by Alesa Vaic himself, is available. So far the simularities as the AV305M has a totally different inner structure, namely the "old-fashioned" mesh plate, for many tubelover the ultimate seduction due to the evident sonical benefits. Beside that, the 305M has slightly more gain: 4.3 in stead of the usual 3.9. Okay, so far very interesting, but is this "just another 300B-alike product", or has the 305M more to offer? After a burn-in period of about 30 hours my answer is clear: Yes! Where the VAICVV300B was my favourite and was the TJ a real runner-up, both have met their superior. In detail, dynamics, control, pinpointing and stereo image, the 305M is very special with an extra bonus that a mesh-plate has to offer!! 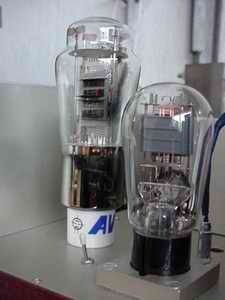 And all of this at an adjustment of 350V @ 62mA, which means that this tube will last as long as a lifetime. As to me: Respect for Alesa Vaic, who made it possible for us to listen to this "Mesh with balls"!! " Meanwhile these 305M's are Cees' property: He would'nt let me take them out of his monoblocks.... sigh.